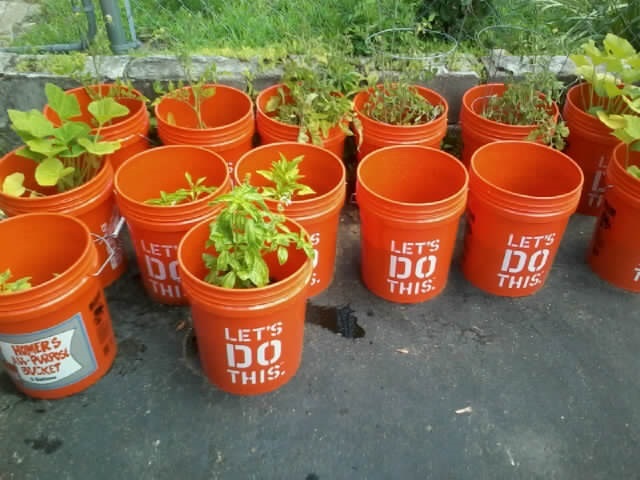 Around Memorial Day, I decided I was going to try my hand at urban gardening. Armed with fifteen five-gallon signature Homer orange buckets from one of America’s favorite home improvement retailers; bags of organic soil; starter plants from a local nursery – tomatoes, both Roma plum and cherry, cucumbers, salad and pickling, summer squash, both green zucchini and yellow, green peppers and basil and a can do attitude I set out to grow some of my own vegetables. I tended my garden every day, watering and fertilizing while imagining the overflow of tomatoes, zucchini and cucumbers my garden would surely yield as reward for all my hard work and diligence. At first things appeared to be on track, my plants were growing. I was excited over the arrival of the first tomatoes on the vine, but as summer progressed I realized there would be no high yield, my plum tomatoes barely larger than a walnut. Luckily, I live in area where I have access to fresh locally grown fruits and vegetables from several local family owned farms and no less than three farmers markets spread throughout the week within a mile from my house and even more within a several mile radius. My urban garden’s summer bounty consists of a still growing basil plant. With more basil than I could eat in one of my summer favorites: caprese salad, I think fresh pesto. 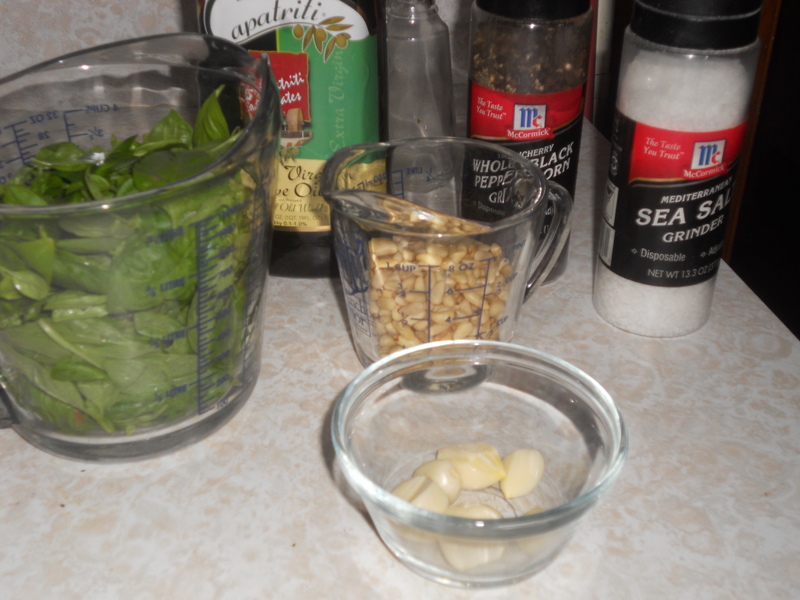 Having never made pesto before, I did have a basic sense of how it is made – traditionally with a mortar and pestle out of basil, pignoli nuts (pine nuts), extra virgin olive oil, garlic cloves, and Romano or parmesan cheese. I perused the internet looking at the recipes of some of my favorite Food Network Stars – Ina Garten, Giada De Laurentiis and Ree Drummond and on simplyrecipes.com and allrecipes.com to get an idea of the proportion of ingredients to another. After comparing the various recipes, preferences and best practices this is what I decided upon for based on the amount of basil I harvested. 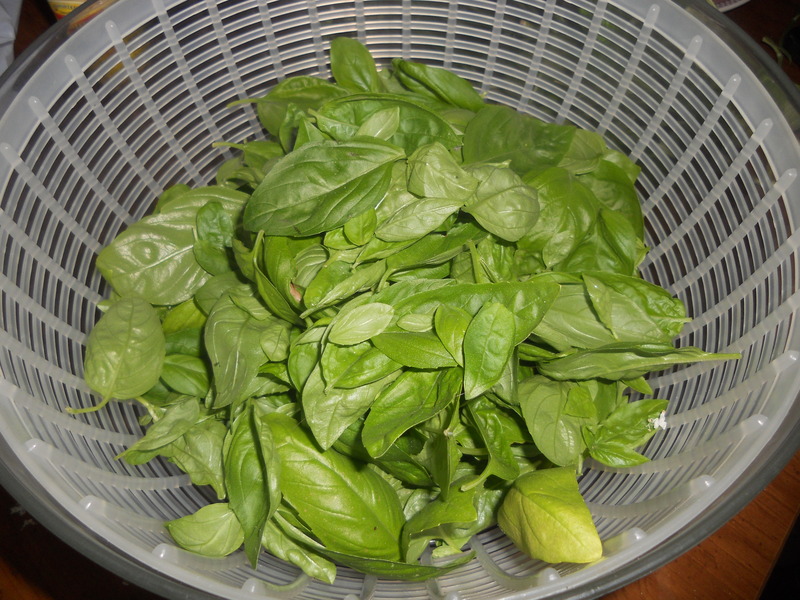 Rinse basil leaves and dry in a salad spinner or pat dry between paper towels. If your preference is to toast the pignoli nuts to bring out their nutty flavor, spread the pignoli nuts in a single layer on a cookie sheet. Place cookie sheet in a preheated 350 degree oven for 6 – 10 minutes, turning the nuts periodically. Remove from oven when nuts are a golden brown. Immediately transfer to a bowl for cooling. Note it is better to under toast than to over toast. 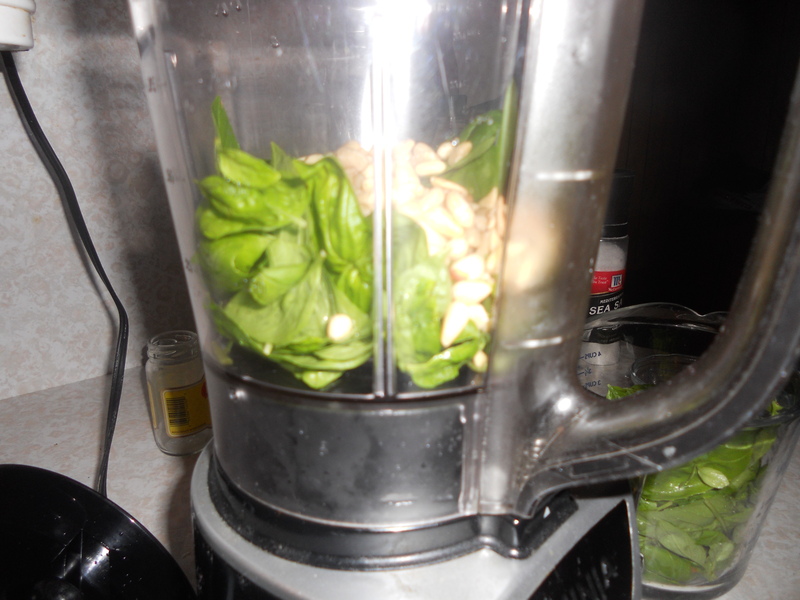 Using a food processor or blender place the basil leaves, pignoli nuts, salt, pepper and garlic in the bowl and pulse blend. Scrape sides to ensure all the ingredients are well blended. 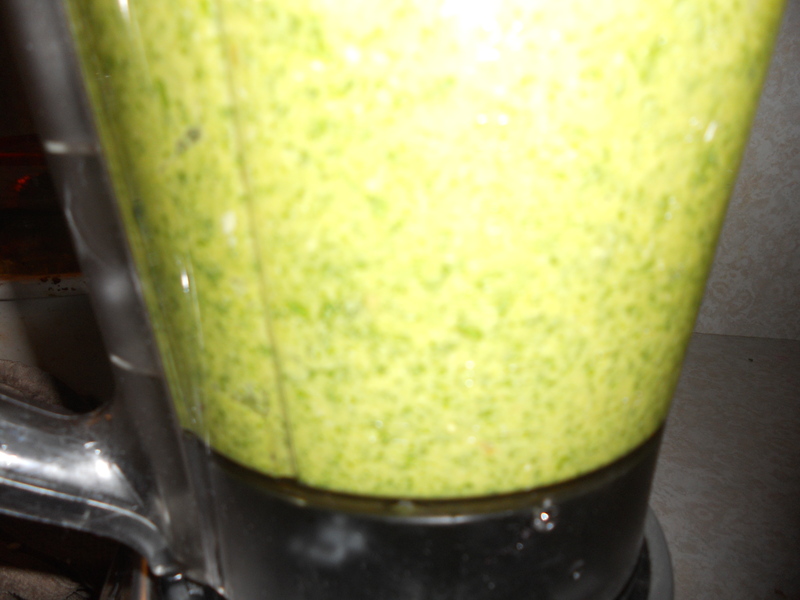 Drizzle olive oil into the mixture as it blends; adding more if consistency of pesto is not creamy or smooth enough. 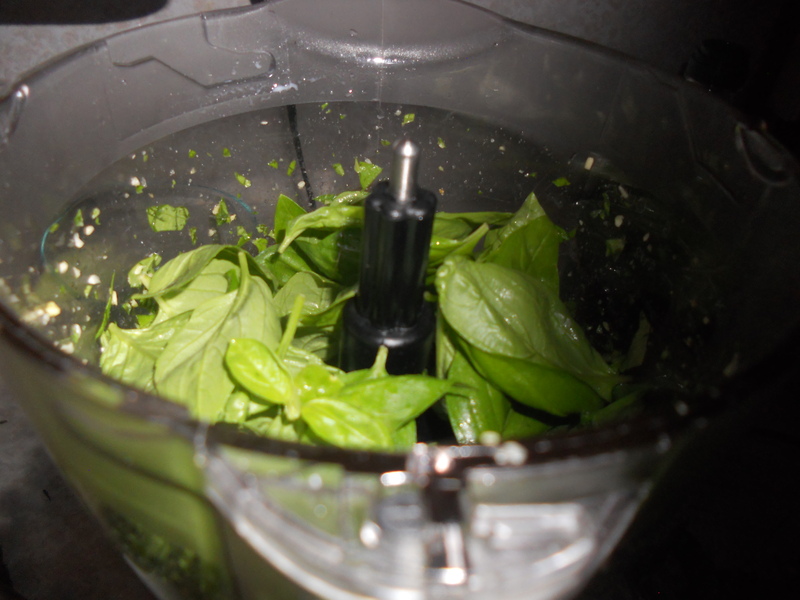 Note if you are using the pesto immediately, add the cheese in with the basil leave mixture. If you are freezing for later use do not add the cheese in until ready to use. If freezing, top jar with a thin layer of EVOO to preserve green color. 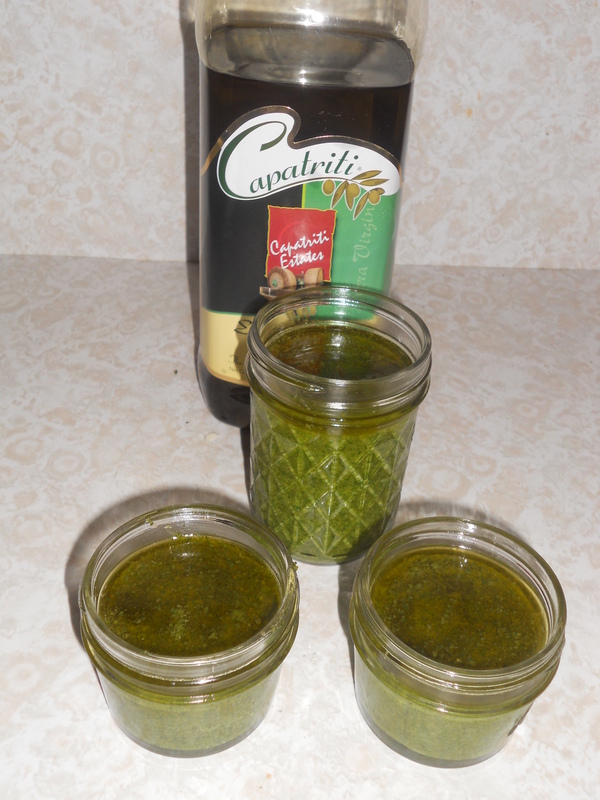 Below are pictures and commentary on my first batch of pesto. 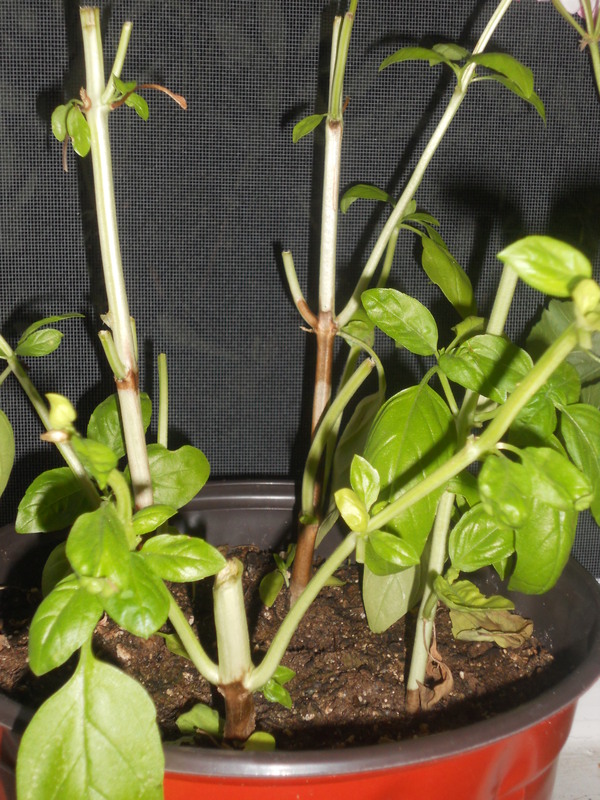 I harvested my basil plant leaving some leaves to encourage continued growth throughout the fall. I rinsed the leaves, spun them dry in my salad spinner and let them sit to dry for about an hour while I did other things around the house. 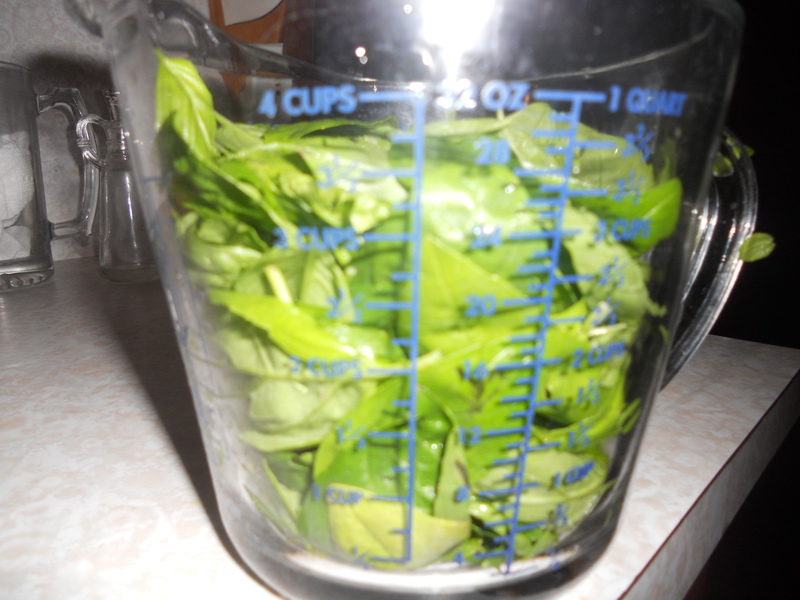 My harvest yielded about 3 cups of basil leaves. My pesto ingredients lined up on the kitchen counter. 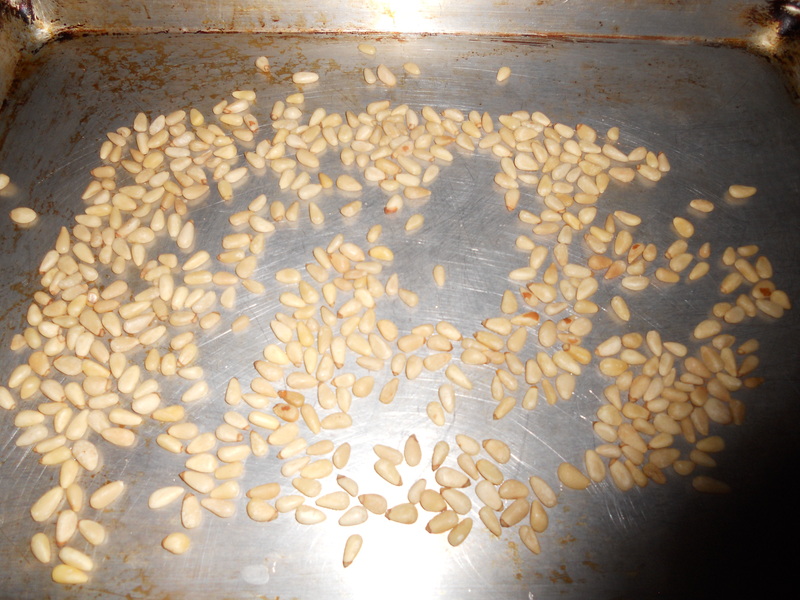 Wanting to enhance the flavor of pignoli nuts, I toasted them in my 350 degree oven for about six minutes. I added about 1/3 of my ingredients into the blender’s bowl at a time. Since I’m freezing my pesto, I did not blend in my cheese and I added a thin level of EVOO to the top of each jar to preserve the color. 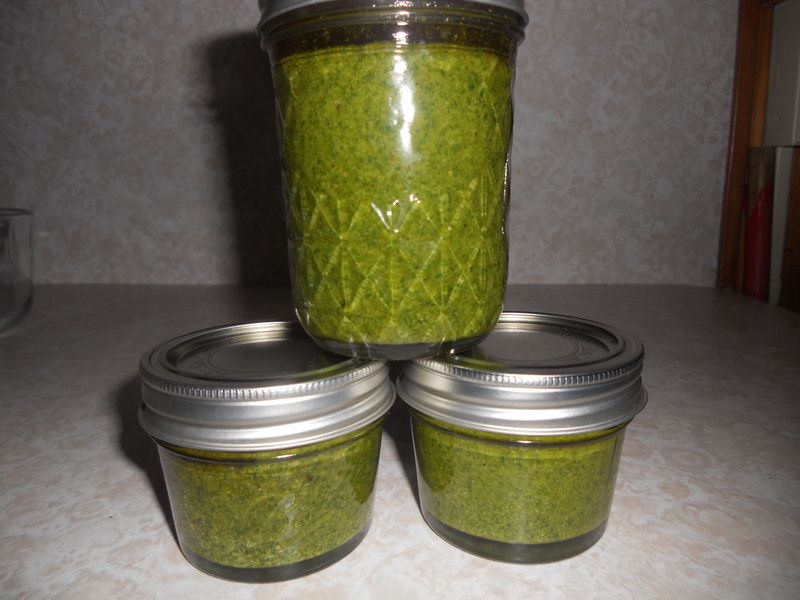 My end result – one 8-ounce and two 4-ounce jelly jars of pesto waiting to be placed into my freezer. Homemade pesto will last about four months in the freezer or five – ten days in the refrigerator. Some cool evening this fall, I will prepare a pesto dish using one of the jars of frozen pesto after blending in some cheese and enjoy my summer bounty.